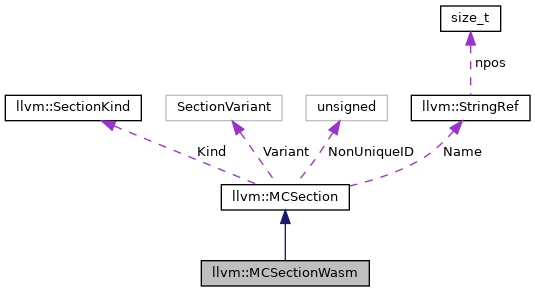 This represents a section on wasm. Definition at line 27 of file MCSectionWasm.h. Definition at line 89 of file MCSectionWasm.h. Definition at line 60 of file MCSectionWasm.h. References isVirtualSection(), PrintSwitchToSection(), and UseCodeAlign(). Definition at line 81 of file MCSectionWasm.h. Definition at line 59 of file MCSectionWasm.h. Referenced by addData(), and PrintSwitchToSection(). Definition at line 75 of file MCSectionWasm.h. Definition at line 78 of file MCSectionWasm.h. Definition at line 73 of file MCSectionWasm.h. Definition at line 72 of file MCSectionWasm.h. Check whether this section is "virtual", that is has no actual object file contents. Definition at line 94 of file MCSectionWasm.cpp. Definition at line 68 of file MCSectionWasm.h. References llvm::SectionKind::isGlobalWriteableData(), llvm::SectionKind::isReadOnly(), and llvm::MCSection::Kind. Referenced by getPassive(), and setPassive(). Definition at line 47 of file MCSectionWasm.cpp. References llvm::MCAsmInfo::getCommentString(), getSectionName(), isUnique(), llvm::MCExpr::print(), printName(), and shouldOmitSectionDirective(). Definition at line 85 of file MCSectionWasm.h. Definition at line 76 of file MCSectionWasm.h. Definition at line 79 of file MCSectionWasm.h. Decides whether a '.section' directive should be printed before the section name. Definition at line 19 of file MCSectionWasm.cpp. Return true if a .align directive should use "optimized nops" to fill instead of 0s. Definition at line 92 of file MCSectionWasm.cpp. Definition at line 48 of file MCSectionWasm.h.